There must be a way, no? Considering that people who don't attend pen show in Japan have the exclusive ink bottle in a week after the opening day. No. Konrad doesn't like to have pen show exclusive inks available except at the show. The Chicago Blue exclusive was available at Vanness for a little while after the Chicago Pen show, but I suspect they must have add more than a few left over. 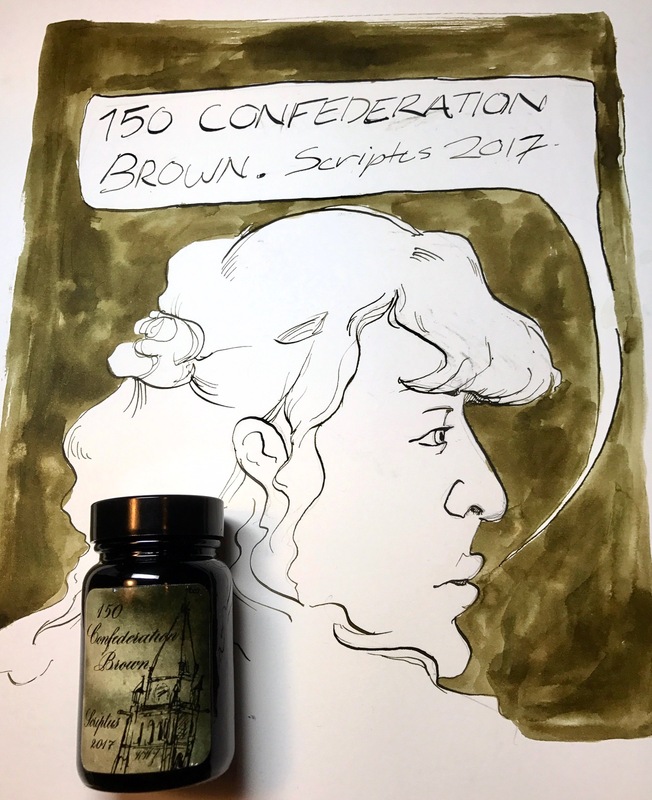 The inks for Scriptus sell out in less than an hour, There's very few bottles made. I think it's more of the decision of pen show organisers, not of Konrad? Actually Cheryl is right. The only reason there were bottles after, was because they were leftovers. Scriptus inks sells out in less than an hour, so no one will be selling them out after. We ordered double this year, (approx 500 bottles) and I am pretty sure it will be gone in a few hours. 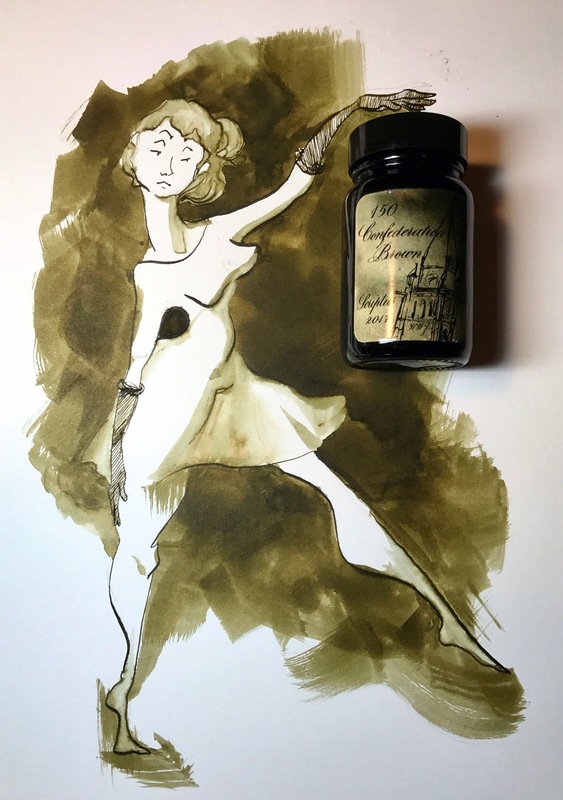 This is gorgeous - and my relationship with brown inks is well.... interesting. I don't know I would call it love/hate, but it takes the right ink on the right day on the right paper in the right pen... 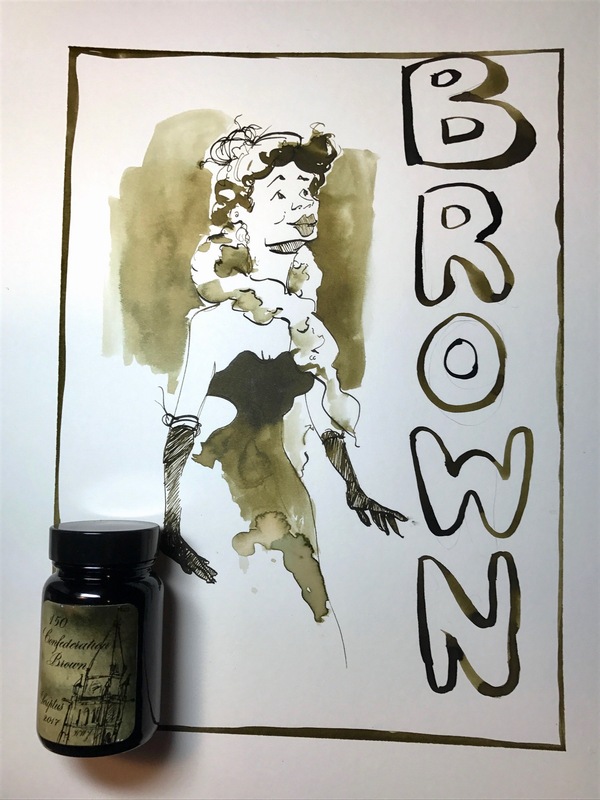 I have only bought one - Diamine Saddle Brown, and as much as I like it, there is something about it that is just... ? Maybe I haven't found the right combination yet. Well that's disappointing. I was hoping either Vanness or a Canadian retailer might have a few of the overflow as well. What a beautiful brown/green, Claudia! Job well done. And your daughter just keeps getting better and better. I think you misunderstood what I said. I'm not talking about retailers selling the ink after the show is over. The inks at Maruzen pen fair are almost always gone on the first day, completely sold out. Yet, people who don't visit some how manage to get the bottles. How does that happen? Surely Maruzen isn't shipping and selling them directly to the overseas customers. Heck, they don't even ship within Japan. Whatever the method is, can't the same be done with Scriptus? I get the Maruzen inks (sometimes) when a friend visits the store and ships to me. I am sure the same way can be done. A good friend of mine, asks all his pen friends to grab the two bottles max and sell him one bottle. Las year, he collected around 10 bottles of inks that he distribute to his friends all over the world. It can be done. You need friends. Ah, i don't even know anyone who lives in Toronto. Anyway, at least they made one colour that I am interested in. My goodness, definitely my kind of color. Oh well. I adore that ink. I am quite jealous. I'd love to have a bottle of that! I'm sure this will be a very nice ink, and for those lucky enough to be at the show and get a bottle it will be very special. But for me this isn't any different than the many Sailor inks custom made for shops in Japan where the only way to purchase is at the store itself. Now if this was a new generally available KWZ ink, I'd be very excited. But an ink like this probably won't ever become part of the regular line. Very nice. Do you happen to know what makes certain inks looks green on coated paper? In this case, the results are attractive indeed! No idea dude.. My use of the word "chemistry" might be totally wrong. Is more than just the cotton content (like with Iron Galls). The more % cotton makes an Iron Gall ink change faster. In any case, the magic of KWZi is prevalent on every drop and every stroke. I stopped trying to guess and just enjoy it..
Loving the artwork Cyber6 - Such flowing lines. The drawings remind me some how my stay at The Hotel Elysee in New York many many moons ago. They remind me of champagne too ! it looks mighty olive green to me. but real nice shading. Stunning ink! Shame it's not available in the UK. No doubt the inks' behavior will be very different, but the color may be close. If someone who has access to both inks could do a side by side comparison, it might help those for whom this ink is unobtainable, find a reasonable approximation. Having said that, I think it truly is unique and beautiful color. Nice enough, I suppose. I have a friend going to this year's show, I wish I'd known him last year.